Paris: Sloane Stephens maintained her perfect record against fellow American Madison Keys as she blazed into the French Open final with a 6-4, 6-4 win on Thursday in a repeat of last year’s US Open final. In the first all-American Roland Garros semi-final since 2002, the 10th-seeded Stephens stayed composed throughout as Keys, who has not won a set against her in three meetings, peppered the court with unforced errors. 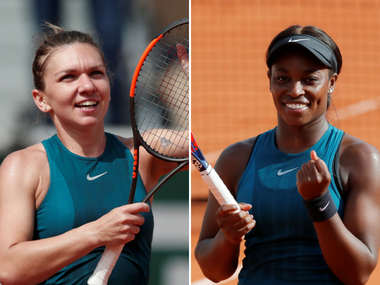 Stephens, who had never gone past the fourth round in Paris, will take on twice French Open runner-up and world number one Simona Halep of Romania in Saturday’s final. Regardless of the result, the 25-year-old Stephens will become the first American to break into the top five in the WTA rankings since Lindsay Davenport — Keys’s coach — in 2006.Halep emphatically ended the impressive French Open run of 2016 champion Garbine Muguruza with a 6-1, 6-4 victory in the semi-finals. “It’s always hard to play someone from your country and such a good friend, but I’m happy I played my tennis,” Stephens said. Next up is Halep, who has won their last four meetings but Stephens, who has a 6-0 win-loss record in finals, is feeling confident. “I think that I have done really well, but I’d like to keep going,” she said. After a timid start, Stephens found her rhythm and took control of the opening set by breaking in the third game with a forehand winner down the line. But Keys, who made 23 unforced errors in the first set, hit back hard and set up a break point at 3-2, only for Stephens to save it with a service return winner. Stephens continued to dominate and broke in the first and seventh games of the second set to put herself in a position to serve for the match. Keys briefly rallied to pull one break back, but Stephens did not waste her second opportunity, sealing victory on her first match point with a glorious backhand winner down the line. Halep assured herself of retaining the No 1 ranking and reached her third final in Paris. She lost both of the previous ones in three sets, to Maria Sharapova in 2014 and to Jelena Ostapenko in 2017. "I will try my best," Halep told the crowd at Court Phillipe Chatrier, "and hopefully I will be better than last year." The Romanian also came up one victory shy of a major championship at the Australian Open in January, beaten there by Caroline Wozniacki. That means Saturday's final at the French Open will be Halep's third title match in the past five Grand Slam tournaments. "I'm happy," she said, "that I can have another chance." Muguruza, a two-time Major champion, entered the semi-finals having not lost a set in the tournament. She also was coming off a lopsided victory in the quarter-finals a day earlier, overwhelming five-time major champion Maria Sharapova 6-2, 6-1. But it took Muguruza quite a while to get going against Halep, who managed to keep sending ball after ball back over the net. Backed by fans who loudly chanted her first name between games, Halep went ahead 3-0 in only 15 minutes with the help of only one winner. Of her first 14 points, 13 arrived via errors by Muguruza — nine unforced, four forced. It was 5-0 by the time Muguruza eventually claimed a game. The second set was more of a test for Halep, who was ahead by a set and 3-0 before falling apart against Ostapenko a year ago. Muguruza's last stand came at 4-all in the second set, a 13-minute game in which she held three break points. But she failed to convert any of those, and Halep held there, before breaking at love to end it.